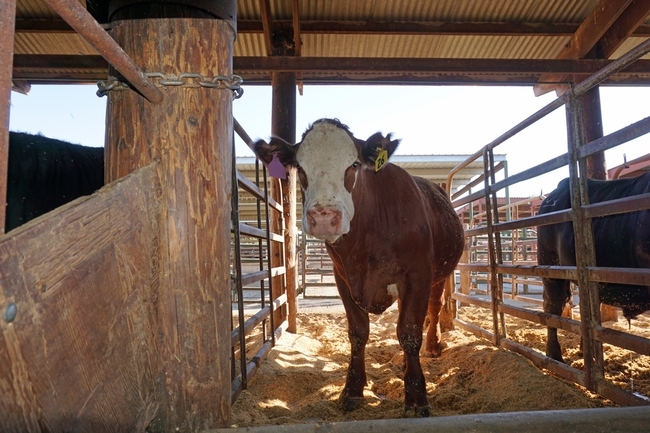 A steer at UC Davis that is part of the Mootral trial, which aims to reduce greenhouse gas emissions from livestock. Belching beef and dairy cows emit a significant amount of methane, sending a potent greenhouse gas into the atmosphere where it can contribute to climate change. UC Agriculture and Natural Resources researcher Ermais Kebreab, a professor in the Department of Animal Science at UC Davis, is studying a potential new solution. In European studies, supplementation with just 15 grams of a formulation called Mootral, derived from garlic and citrus extracts, killed bacteria in the cow's gut that produce the gas emitting from the animals' mouths and nostrils. Methane emission was cut 30 to 50 percent. 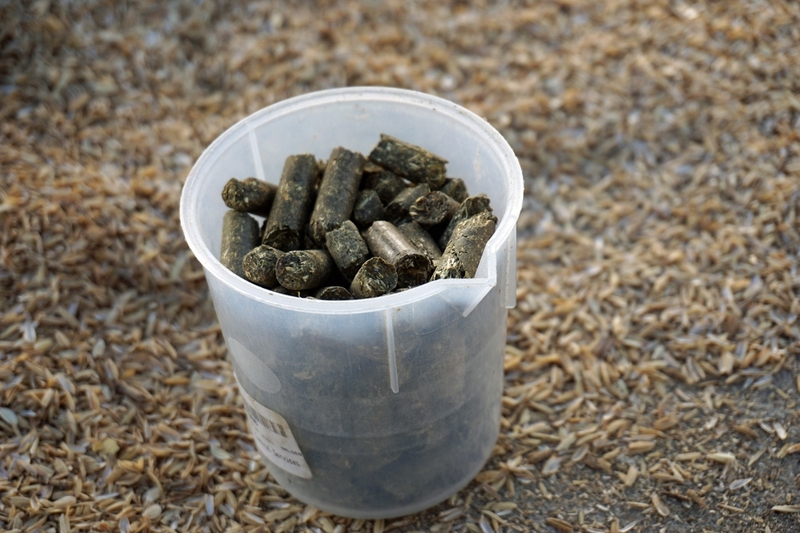 Kebreab and his staff are feeding the supplement to nine California cows at the UC Davis farm and comparing their emissions with nine cows on identical rations minus Mootral. 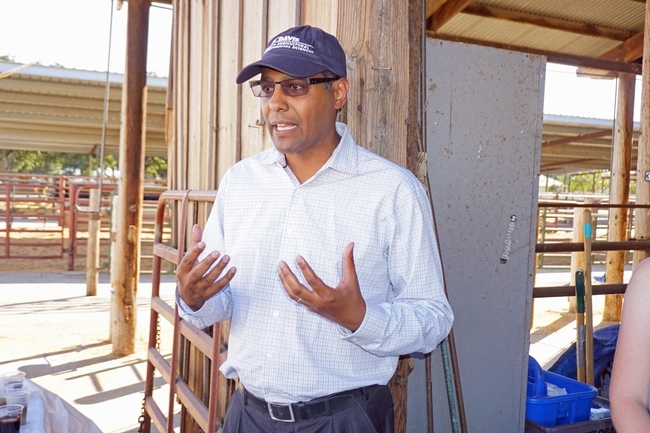 UC ANR researcher Ermais Kebreab is leading a trail at UC Davis comparing cattle that received the Mootral supplement with those that did not. The research was shared with writers in Sacramento for the International Food Bloggers Conference during a pre-event excursion to the UC Davis ag barn. "This research is highly relevant in California," Kebreab said. "The state is committed to reducing its greenhouse gas emissions to 40 percent of 1990 levels by 2030. We need to reduce the environmental impact of livestock production." Mootral is fed to the cattle by adding it to alfalfa pellets. "It's like Beano for cows," said one food blogger. If Mootral is effective in reducing livestock's greenhouse gas belching, and the product is found safe for the animals, scientists may be able to put together a protocol for the farmers to claim credit for cutting greenhouse gas emissions in a cap and trade scenario, Kebreab said. After visiting the cattle, the food bloggers ate dinner at UC Davis' Gateway Garden, becoming the first Americans to try beef from cows that received the Mootral supplement. 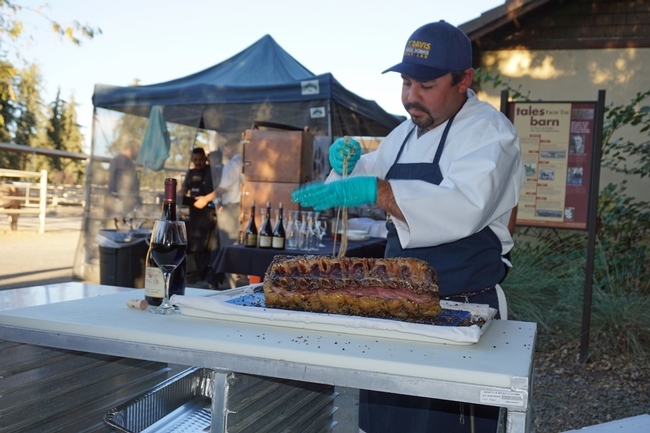 Manager of the UC Davis Meat Lab, Caleb Sehnert, prepared prime rib from an animal treated with Mootral. 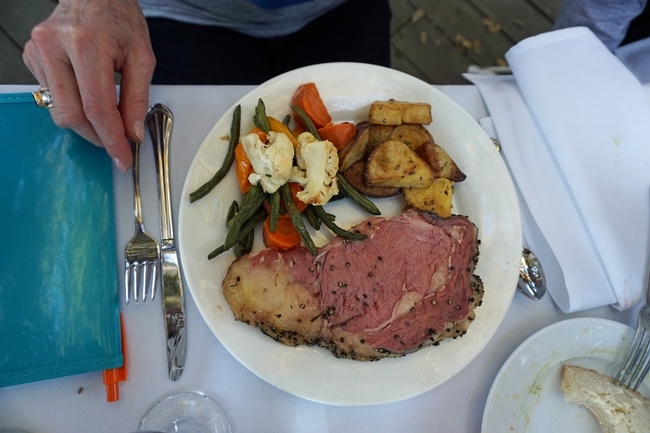 Food bloggers enjoyed a prime rib dinner at Gateway Gardens on the UC Davis campus. Great article, thanks for sharing 🙂 I’ve found a lot of information interesting for me.